No PI is without them. They are our invisible support network, but have our friends really considered the obligation that falls upon them as friends of a Private Investigator? Yes, obligation. Friendship, after all, has its price. 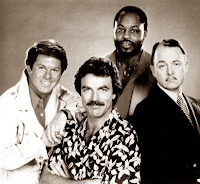 Now Magnum had TC with his chopper, Rick for his swanky club and questionable ties with Icepick and the criminal underworld, and Higgins for the Estate and the Ferrari. (Sure, it belonged to Robin Masters but we all know that Higgins really was Robin even though earlier episodes directly contradicted this). When I look at my collection of friends, I am saddened that they just do not measure up to that standard. Sure, I get fed regularly in between clients. Sure, they buy me endless cups of coffee. Sure, I sponge off them as much (if not more) than the next guy, but what do they really do for me? I mean, after all, they get to vicariously live an adrenaline action-packed life through me, their perpetually down on his luck but plucky PI friend. How many people would give their left testicle to be in that position? Quite a few I imagine. Consider this an open invitation all you swanky club, Estate, and helicopter owners whose lives are just not complete without a PI friend. Contact me and be part of this exciting world of neverending mystery and adventure. Just like it says on the box. So, can I borrow the Ferrari? Sure! The keys are on the coffee table.